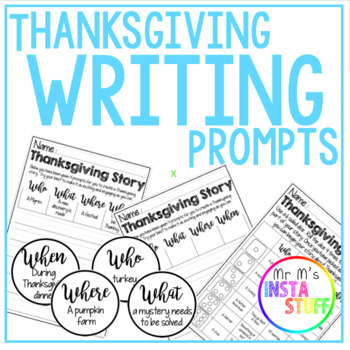 This is a 15 page PDF containing Thanksgiving themed writing prompts as well as pre filled and blank writing frames . 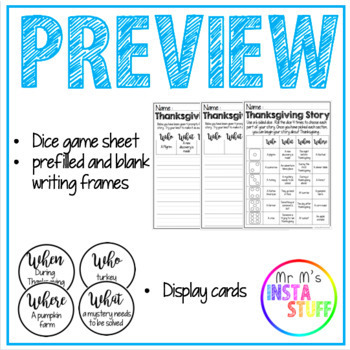 Building on the who, what, where and why writing strategy, this pack allows for writing to be scaffolded into an easy structure that leaners will enjoy during this Thanksgiving period . PLEASE NOTE | All forms are UK A4 size . ■ SUGGESTION : Display cards should be printed out on bright high quality paper and laminated . Worksheets can be created into a workbook or used as single pages depending on needs of the leaners . If you need help with this product, please contact me!